There’s a lot more to eggs than meets the eye. We all know that they pop out of a chicken, and then a chicken pops out of them. But what do we know about that first chicken? If you look at your egg carton, you’ll likely see a happy chicken strutting around beautiful farmland, or eggs sitting in a warm and cosy-looking nest. It’s a nice thought, but sadly it’s very rarely the case. Take that happy chicken, and stick her in a cage. Not a big cage where she can move and walk around, one so tight that she can’t even flap its wings. And she’s not alone in there. There are other chickens in her cage, and next to her cage there is another cage, and another cage, and another cage. She never goes outside. In fact, she’s never even seen the sun. Or green vegetation. She has no idea of anything but cages, concrete and thousands of other chickens. She’s not so happy any more. That’s where most of our eggs come from. But not everybody does it this way. I’m sure you’re familiar with the phrase “free-range”. 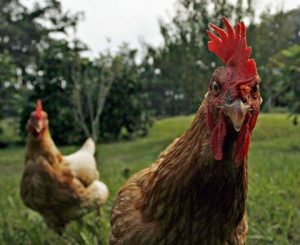 The standard for free-range is largely unregulated, and though producers are not meant to range more than 1,500 chickens per hectare some exceed 10,000. As such, the phrase ‘free-range’ holds about as much weight as the word ‘lite’, which is to say not much at all. Some farms do truly stick to the free-range ideals and standards, but lack of regulation makes the abuse of these ideals for marketing and profit far too easy. If the carton in your hand reads “organic”, best check for a certification. Egg producers can use the word if the feed they give to their chickens is organic, but this doesn’t necessarily mean that they meet the ethical standards demanded of certified organic products. Firstly, organic eggs must be laid by chickens who have enough space to exercise and flap their wings. They must be granted access to the outdoors for 8 hours a day, have a nest or a perch and not be debeaked. They do also have to be fed exclusively organic feed and not be treated with antibiotics unless there is a contagious outbreak. If you have real concerns about the welfare of your farm animals, take the time to get to know your brands and what they’re really doing. Remember that as a consumer, they are accountable to you. And if you want the egg, the chicken comes first.